What homeowner tools do you own? A toolbox is one of the vital necessities in every home. You never know when those windows will need a DIY fixing or you want to tighten that loose nut on the door of your garage. But when it comes to buying a toolbox, it is critical that you choose from a renowned and reputable manufacturer. For rookies, you do not need all the devices in your home immediately, but one by one tool will eventually help you in emergency fixing that may arise anytime. So, whether you are cleaning your roof or hanging a picture, this info is for you Mr. do-it-yourselfer. Here are the basic tools every homeowner beginner should have in order to get through many projects around the household. New Homebuyers, grab your pen and paper. Topping our list of the number one homeowner tools has to be a hammer or screwdriver. We picked the hammer. This is smooth-faced claw hammer with a flat head on the front to position the nails. A little different from its sledgehammer brethren here in the pic. It has a mix of heft and flexibility for driving nails and claws for prying up objects on the back. If you want to hang your best pictures on the wall, then claw hammer is the best for this particular job. For pulling out nails from the walls let’s say you no longer need the pins in the wall then curved claw hammer is useful for pulling out the nails. The hammer. The obvious top shelf award winner of homeowner tools. An excellent tape measure should be 25ft and big enough that won’t break or rollout. This is one of the tools that almost everyone forgot to buy but you cannot do anything without measuring. Having one screwdriver in your home is enough, though it isn’t always a good decision. Both flathead and a straight screwdriver with a shaft and two-sided bits at each end of the shaft are the best. You can start with three sets of flat-headed screwdriver large, medium and small and it will make a difference in your home. Keep a variety of these homeowner tools handy. Small and large sizes of both cross-point and common screwdrivers should be on hand. You will be surprised at how often you reach for one of these. If you’re like me, you have a large stash and variety of these in the toolbox. I also keep a couple of the most common ones in the kitchen drawer. You might save a few dollars down at Home Depot. You might think about your local hardware store before you run down to the big box store. Why? Because you need a trusted ally. Being a homeowner means that you will always be tinkering with something that needs fixing in your home. It’s just par for the course. I have an Ace Hardware by my house. Not only do they carry several nice screwdriver sets, but they also employ some people who are long-time employees. They know me, and I know them. I like that a lot. By purchasing my screwdrivers there it allows me to support the local talent per say. It helps insure that this hardware store will continue to be there. That Ace hardware store serves most of us who own property here in the Arizona Biltmore and Arcadia Lite areas. On a side note, Ace hardeware has a giant selection of the screws, nuts, and bolts of every shape and size. So when you need a tiny little set screw for a towel bar, you can find it. When you need to find some odd-ball weird nut or bolt, they’ve probably got it. Again, nice to have a trusted resource ion your hip pocket. This is best when you are constructing a new room as it will be helpful when cutting paint around the windows that are held to the drywall. Utility knife is for removing and trimming the edges of the carpet and filling dings in the walls. This small flat knife has endless uses hence you really need to have one of your own. Use it to cut a piece of carpet, score a piece of drywall, or open a plastic box. Like a said, a million and one uses. If you are looking for right pliers for your home, a needle nose pliers, lineman plier, diagonal pliers and slip joint pliers are the best plier so far. With your own pliers, you will be able to hold your furniture or bed intact thus covering your snipping needs around your home. Pliers will help you in cutting and gripping around the objects. This is one of those homeowner tools that you may even have a duplicate handy in the kitchen drawer just in case. There are two types of wrench; adjustable and foldable Allen wrench. A foldable Allen wrench is small hexagon L-shaped wrench while adjustable wrench has one fixed jaw that allows you to adjust to any size you might need. A wrench is necessary when turning off a stubborn plumbing valve that means when there is zero wrench no plumbing activities taking place. A level is one of the things you must have in your house. You wife would love to hang some pretty pictures or ornaments on the wall. You may want to install some cabinets hence level will be best for you in that case. Start buying one at a time starting from 4 inch and 2 inch levels. This rechargeable 4-volt lithium-ion battery or magnetic stud finder will help you find the home framing studs. A stud finder should be a must for mounting heavy objects on the interior walls and for hanging things on the walls. This is a must-have. 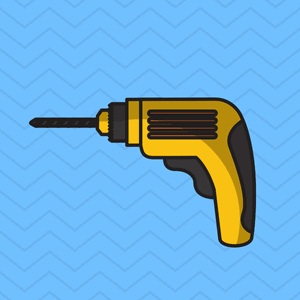 If you have ever needed to drive a 3-inch screw into a piece of wood you know that a screwdriver just won’t cut it. Gotta have a drill. It’s one of those tools that you might not use for 3 months in a row. Then, all of a sudden, Christmas shows up and you’ve got to assemble things with what seems like a thousand long screws. It will be handy when you need to hang a heavy object from a wall, or to change out 47 cabinet door knobs. When you buy one be sure to snag one that comes with an extra battery so that you have a backup ready when battery number one is drained. Homeowners tools that property dwellers should have are a couple of paint brushes and rollers. It’s like a right of passage. You really can’t be a true homeowner if you haven’t painted a room or two. Furthermore, having a quality brush handy will help you keep your place looking sharp between full paint jobs. Taking the time to touch up your paint annually will put off the cost of that professional complete interior repaint. So, go buy some paint equipment. Do not go cheap here. A professional journeyman painter cannot do the job right without the best equipment. The workmanship will suffer and the frustration level will soar. It’s worth paying $20 for a good paint brush. Try the Purdy and Wooster brands. If you have textured walls buy a lambswool roller sleeve. it’s going to run you ten bucks. Again, if you go cheap you will suffer in the end and the job will be noticeably less than stellar.